LiveDrive Review - Are They Back Into Cloud Business? Is LiveDrive Good Enough To Be Considered? LiveDrive started their business in December 2008. They are just merely 5 years in the cloud storage business. But they have grown exponentially since then and has gather that much of users. They had earned more than 1,000,000 customers around the world up to date. I guess is not hard to see why. People love to use their product. LiveDrive is an UK based company. They are the fastest growing cloud storage and online backup company on the web today. I believe facts and figure will reflect the reputation by themselves. LiveDrive certainly is a reliable and trusted cloud storage vendor. What’s In The 2TB Briefcase? The Briefcase plan is among the favorite and popular plans in LiveDrive. The Briefcase gives you a 2TB capacity. This is way more than any other vendor that could offer. The installation and usage is very easy. Download and install the software. This will takes you less than a minute. Setup, registering and sync for the first time, probably takes you another minute there. Then, you’re done! 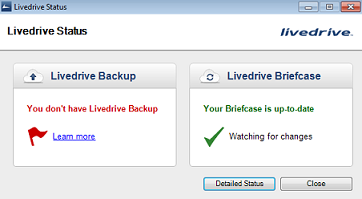 LiveDrive storage will appear as an additional drive in your PC. So, it would be like you had just bought a 2TB hard drive. The difference is all your data store in the drive will be sync into the cloud. This will give you more security and flexibility as you can access your file anywhere as long as you are connected to the internet. Basically, all I need to do is just drag & drop whatever file that I want to backup into the L: /. There’s no limit on the file size and file type. File restoring is just as easy. Even though, the Briefcase only can backup 1 computer. But you can add additional computer anytime for just $1.45/mo. What is file versioning anyway? File versioning is like a double backup for your file. It can revert back your deleted file. You can restore back the original version of the overwritten or deleted file/ folder anytime. LiveDrive gives you 30 file versioning and will keep them for 30 days before a new cycle begin again. So, you know you are being protected in every possible way. 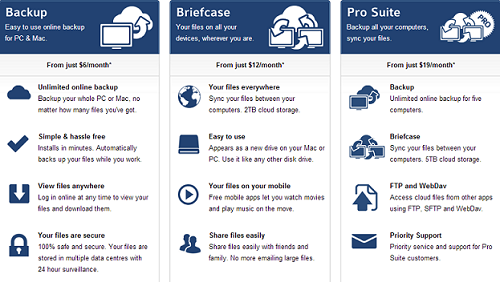 There's so much more space that you can store with LiveDrive today! While all of these are not being offer from other vendor, LiveDrive make them standard features for their plans. Online file editing does not include in Backup which is the basic plan. 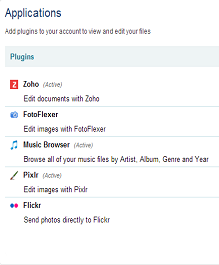 Great things about this features is you can edit your office document, your photo using the web browser and upload the new files to your cloud storage. Normally this would require you to use your PC or laptop software but LiveDrive make them easy for you. 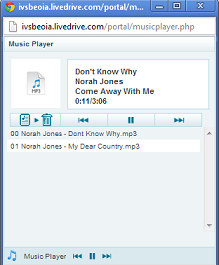 You can even stream your favorite movies and songs directly using the web browser. Pretty cool feature there. Your LiveDrive account travel with you whenever you go. You can even access them using your mobile device. Did you know that this are the few highlight features that only available in LiveDrive? How Safe Am I With LiveDrive? All files are encrypted using AES-256 bit. This is a standard protocol for banking and military usage. All your data are store in a few different data center. What they called Geo-Redundant Storage. If anything happen to the main data center such as nature disaster. There’s always a backup for all your data at other places. Your online account is protected by password. You always know what’s happening. There’s a status window to know if you’re protected and backup. Did you know LiveDrive & eFax are from the same company? Conclusion: Is LiveDrive Worth The Try & Buy? I would definitely recommend LiveDrive. LiveDrive is a good product. They do not push you to signup with them. During my free trial, I remember I only receive two emails from them. One is a welcome email and the other is to inform that my first file upload has been successful. LiveDrive offer fair and great price compare to the features and benefits. If you are at budget, you can choose the basic plan which gives you equally the quality of services and product. There's absolutely no credit card info require!